At nine o’clock sharp, the JR Shinjuku station the Chuo line track 10, I got on the Limited Express Azusa #9 bound for Kofu, Yamanashi Prefecture neighboring Tokyo, to join the event cerebrated the centennial anniversary of Tomi-no-oka vineyard by Suntory, beverage and liquor maker. As I designed a logotype for the vineyard’s centennial anniversary, I’ve been thinking to visit there during the centennial events would be held by the end of this year. 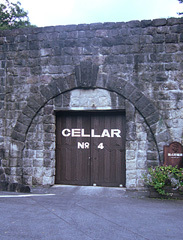 The event I submitted included a tour in the winery and a special dinner with five Tomi-no-oka wines. 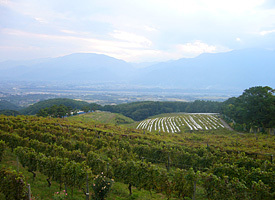 As the train approached Kofu, vineyards spread along with the track, Yamamashi is known for producing some kinds of fruits, especially Kofu, where is the land suitable for vineyard. After arriving at the Kofu station, to waste a time until the tour would start, I came by Yamamashi Museum to see the Millet collection. Taking a lunch with Houtou noodles, famous as popular food for Yamanashi people, then returned to the Kofu station. Getting on the shuttle bus to the vineyard, it took around twenty minutes, then the buildings in the winery covered with white wall appeared among the mountain. 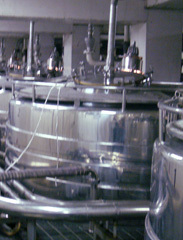 After an entrance procedure, the tour started with the guidance by Mr. Shounai, Brewery Manager. 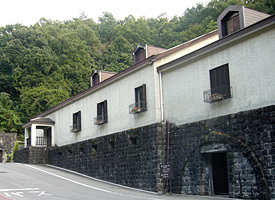 As the tour started from the evening, all production line in the factory had already finished, we just went through the brewery facilities to see all rooms one by one and arrived at the wine cellar in the tunnel of the Tomi-no-oka hill. 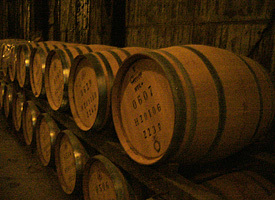 A hundreds of wine casks were laid quietly and waiting for bottling. 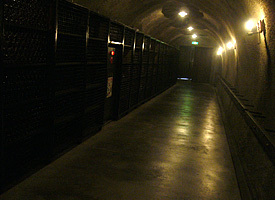 The next room preserved the thousands of wine bottles waiting for the release date. After watching the facilities, we got on the bus again and went to see the vineyard. The bus went through the forest, then the vineyards appeared in front of the bus. 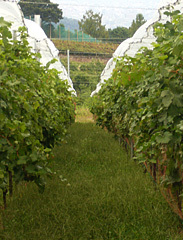 The vineyard spread on the southern slope on the hill with direct sunlight. 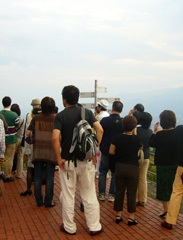 From the top of the Tomi-no-oka hill, I could see the Kofu Bonchi Basin surrounded by high mountains called Minami Alps mountain chains, named after the Alps in Switzerland, but unfortunately, clouds covered Mt. Fuji. 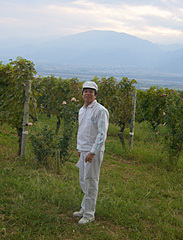 Shounai allowed the tour members to bite grapes in the vineyard, known as Merlot for red wine, where would be harvested soon. “Wow! Delicious and Sweeeet! 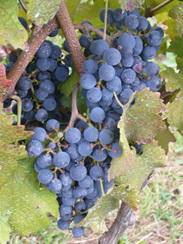 !” I didn’t expect the grape for wine is very delicious. 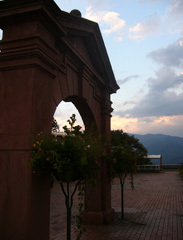 Then, evening twilight has come, the sky turns dark, the town lights in Kofu area started to lit up. The twilight dinner started and served beautiful and brilliant skilled dishes by the ingredients in Kofu with five Tomi-no-oka wines. 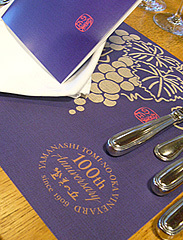 We enjoyed the marriage with delicacies and wines. I was very glad to find the vineyard is excellent and fantastic place, and it was a great chance to work for the vineyard. 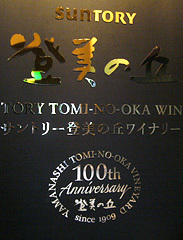 To the next hundred years of Tomi-no-oka vineyard, Cheers! 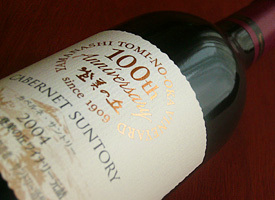 Left: The bottle cerebrated the centennial anniversary for the Tomi-no-oka labeled with the logotype I made (Not for sale). Creative director of Suntory send me them after the tour. 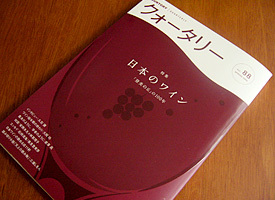 Right: The quarterly magazine published by Suntory titled “クォータリー: Quarterly” Vol.88 described the history of Tomi-no-oka vineyard.